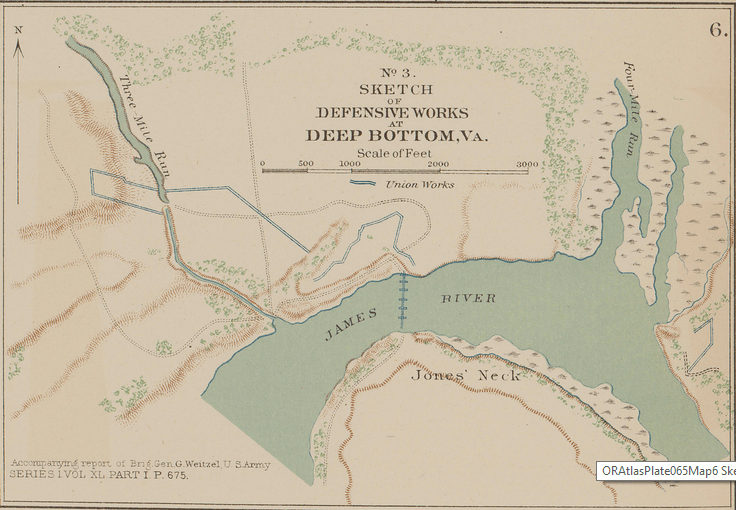 One hundred and fifty years ago today, a small skirmish occurred at the Federal bridgehead at Deep Bottom north of the James River and southeast of Richmond. The 7th Georgia attacked the portion of the Federal picket line held by three companies of the 10th Connecticut. Deep Bottom, Va., Aug. 1, 1864. Detachment of 10th Connecticut Infantry. Abut 5 p. m. the Confederates advanced a strong line against part of the picket line held by three companies of the 10th Conn. The attack resulted in the driving back of the vedettes upon the main picket line, which was then deployed as skirmishers and checked the enemy’s advance. Twice the COnfederaes attempted to break the Federal line, but the picket reserve had in the meantime come up, and both charges were repulsed. The Union loss was 1 killed and 2 wounded ; the enemy’s casualties, although not reported, were undoubtedly heavier. Deep Bottom, Va., August 2, 1864. GENERAL: I have the honor to forward report of a severe picket skirmish between a portion of my command and a considerable force of the enemy yesterday. About 5 p. m. the enemy advanced a well supported line of skirmishers against that part of our line occupied by Companies G, K, and A, commanded by Captain Greaves and Lieutenants Marshall and Sharp. The attack was very sudden and severe, but only resulted in forcing our vedettes back on the picket-line. The pickets were immediately deployed as skirmishers and their stubborn resistance checked the enemy’s advance. He immediately brought up his reserves and made a desperate charge on our line, evidently with the expectation of being able to break through and get in the rear of our pickets before the reserves could come up. But the line had already been strengthened by the arrival of the main reserve under Captain Goodyear, and the charge was repulsed with severe loss. The enemy rallied again and made a second attempt to force our line, but with no better success, being again driven back in confusion with severe punishment. Our own loss was slight, owing to the men being well covered and having the advantage of acting on the defensive. The conduct of the officers and men in this affair was such as to elicit the commendation of the commanding general. Herewith I inclose a dispatch from General Foster, received last evening; also an official list of casualties. 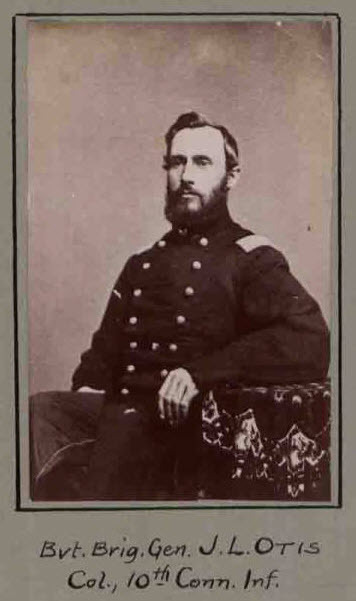 In an effort to learn more about the Union defenses at Deep Bottom, General Field ordered Anderson [and his Georgia Brigade] to send a regiment forward to reconnoiter on August 1. The 7th Georgia, with its left flank on Four Mile Creek, moved toward Alfred R. Buffin’s house south of New Market Road. Beyond the house the Georgians encountered the Union picket outposts. Driving the pickets of Companies A, G and K, 10th Connecticut, some 200 yards across Kingsland Road towards Mrs. Emily J. Grover’s , the men of the 7th Georgia encountered the main reserves of the Union picket line. Two attempts to force their way through the reinforced picket line failed, so the men of the 7th Georgia retired “under the impression, from the resistance met with, that there [was] a considerable force” at Deep Bottom. During the skirmish, the 7th Georgia suffered the loss of two men wounded. As they advanced, they found two dead Union pickets. Total Union casualties reported were one killed and two wounded (one mortally). So Field satisfied himself that the Federals were still definitely in force at Deep Bottom. What he didn’t know was that within two weeks they’d launch a second offensive from that bridgehead, this one consisting of more men and the fight lasting longer than the first.